At a conference in Europe in the last days of the Soviet Union I was assigned a hotel room to share with a prominent biochemist from one of the Soviet republics, with whom I was not well acquainted. The next morning when I awoke, she was dangling a crystal pendulum in the air, watching which way it turned, as a source of guidance in planning her day. Crystal lore is part of the “new age,” which has caught on around the world as an expression of hope based more on magic than on science. During the 1970s and ’80s, Soviets surpassed the West in their fascination for apolitical “new age” theories, positive thinking schemes, magical healing techniques, and spiritualism. I was not surprised to see a Soviet woman dabble in the paranormal, but I was surprised to see a scientist do so. During that same period — the 1970s and ’80s, another “alternative” subculture was also widespread throughout the Soviet bloc: the dissident movement, or perhaps I should say “movements,” since different groups had different objectives. While one stood to lose nothing by participating in the New Age activities, participating in dissident groups was strongly penalized and automatically made one into a social outcast. Even today, many people who could have qualified as dissidents refuse to call themselves that, partly because of the old stigma attached to it. Dissidents were generally regarded as half-mad, crochety extremists (and some of them deserved that reputation) but I respect even the fiercest of them and shall use the term “dissident” here as an honorable title. I will discuss both of these subcultures before explaining why they are being juxtaposed in a single chapter — especially since there was little or no contact between them and few people belonged to both. To anticipate my argument, I want to suggest that they constituted two very different ways of welcoming change. One Russian exponent of the New Age subculture is Andrei Orlov, a sometime peacenik in his thirties who is an amateur expert on crystals.1 When I phoned for an interview, he and his wife invited my assistant, Julia Kalinina, and me over to dinner. Besides other useful facts, I learned there that, if you know where to look, you can go to certain spots around the perimeter of the Kremlin, scratch in the dirt, and dig up pieces of quartz. But please leave them there; they have been planted in those exact locations so that their good vibrations will counteract the evil ones that still haunt the place. Andrei is no “dissident,” no estranged intellectual, but a successful rock record producer and journalist who travels often to North America. As a sports fan, he believes that one of the great cultural transformations in his society began in 1972 when 5,000 Canadian tourists came to Moscow for a hockey tournament. ANDREI ORLOV: There was a big two-week-long party in Moscow, with Canadians in all the streets waving Canadian flags, and that was perfect diplomacy for me. After that, no one could believe that Canada could possibly be an enemy of Russia. They are fun, they play great hockey, they beat us at hockey and we know that. If you love ice hockey and there is a guy sitting next to you who is booing your team and yelling for his team, he is a friend. I have a lot of those. Such stories were not rare in the last decade of Soviet society, where the New Age culture was even more popular in high levels of Soviet society than among educated Westerners. Parapsychology, for example, became quite a fad. If anything, it was evidently encouraged during the Gorbachev years, to the dismay of straight Marxist-Leninists, and also of genuine scientists. In opposition to Kapitza’s criticism, it is possible to view the New Age subculture as a positive development — a sign that humorless and politically correct Marxism-Leninism has been overtaken by a more flexible, open-minded attitude. Probably Kapitza frowned on an event that took place at the Kremlin in 1989, as described by Tarzie Vittachi. The majestic hall is packed with 1000 people. Mikhail Gorbachev, President of the Soviet Union, General Secretary of the Communist Party of the Soviet Union, Chief Executive of All the Russias, successor to Lenin, heir to Karl Marx’s dictum, “religion is the opium of the people,” is seated on the rostrum. Flanking him are a smiling Eduard Shevardnadze, the Foreign Minister who succeeded the grim Gromyko, and Archbishop Pitirim, Metropolitan of the Russian Orthodox Church, his off-white mitre matching his waist-length magnificently brushed beard. Below, on the second deck of the historical dais, stands a Hindu Sadhu, a permit-priest from India in saffron robes, the red tilak mark blurred by the ash on his forehead. He raises his right hand and, in the silence, the sound of the mantra OM resonates in the chamber. He encourages us all to join. An even greater star of the New Age is an Assyrian healer named Dzhuna Davitashvili, who is generally understood to have treated both Brezhnev6 and Gorbachev. Although she has given numerous interviews to newspapers, she has not disclosed any details. Dzhuna’s alleged “healing hands” have been studied scientifically in bona fide research institutes, which have declared that at least she is not harmful. If I seem to favor parapsychology, crystals, Hindu mantras, magical saucers, and healing hands, it is not because they are scientific breakthroughs into uncharted realms, but only because they are so un-Soviet. Anything that would have appalled all three of those giants, Marx, Lenin, and Stalin, can’t be all wrong. It will be instructive to compare the New Age community of discourse to a very different group, who nevertheless are also deeply un-Soviet. Most of our attention in this chapter will be devoted to them for, unlike the New Age people, they were politically engaged, intensely loyal to each other, and intent upon changing their society. The popularity of the New Age subculture in Russia takes on special importance in the light of that society’s political and religious history. Unlike most European countries, where the protestant reformation allowed a variety of different theologies and churches to flourish side by side, in Russia the Orthodox Church retained unmatched authority and an alliance to the autocratic monarchy.10 The Czars were slow to introduce reforms, and by 1917 the last one was forced aside to make way for a liberal democratic government led by Alexander Kerensky who, within the year, was overthrown by Lenin’s more radical Bolsheviks. In such circumstances, it was inevitable that Communism should be equated with atheism. There were no alternative liberal protestant churches and no communities of liberal Catholics. Nevertheless, the Orthodox priests lacked the habit of challenging authority. As soon as it became clear that the Bolsheviks held authority, the Church adapted to the new reality and almost never criticized the abusive practices that became common over the next seventy years. By the 1980s, the doctrinal contradictions between the Church and the Communist Party seemed less significant than the qualities they shared: They both were authoritarian, anti-democratic, and they supported the status quo. Anyone who wanted democracy would have to seek it in a system of thought that was alien to Russian culture — such as perhaps a New Age religion. Dimitry Furman is a Russian sociologist who specializes in religion and politics. He had a bad cold when we talked in March, 1994, sitting in the wide hallway outside Mr. Gorbachev’s office, yet he gamely lectured into my tape recorder about his research. He was trying to explain some surveys that he had conducted in 1990 and 1991. With his hands he drew two opposite poles on the coffee table on either side of the tape recorder, identifying one pole as the atheist Communists and the other as the Orthodox Christians. DIMITRY FURMAN: The stronger the Orthodox beliefs (or the stronger the atheistic beliefs), the more authoritarian are the political beliefs. Those who are democratic are here in between, you see. The people with the more amorphous, fuzzy religious consciousness are more democratic. FURMAN: Yes, but in Western countries, people here in this middle zone have a coherent, structured world view. It can be religious, humanistic, socialistic — but structured at the same time. This is the zone of social democracy or Christian democracy. In Italy or Germany you can find a person who is a sincere Catholic or a sincere socialist and at the same time democratic. But in our tradition, those are impossible. Our historical ideologies are Orthodoxy and Communism. Here, if a man is a strong believer, he is for the Czar and for Russian nationalism. If he is an atheist, he is a Communist. 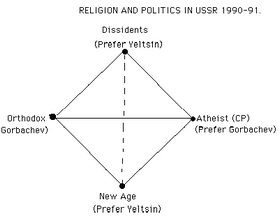 In our survey there was a strong correlation between belief in UFOs and a preference for Yeltsin over Gorbachev. UFOs! My word! (Laughter.) Why so? 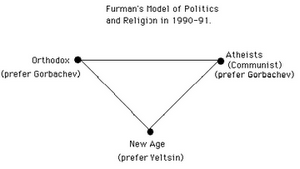 FURMAN: In telepathy, in oriental cults, and the preference for Yeltsin. Very strong! New Age! [He points to a place between the two poles and below them.] Sympathy for Gorbachev and the Soviet Union were strong here among the Orthodox and the atheist Communists. They are for the KGB, for a strong Russian empire. The Orthodox and the Communist atheists preferred Gorbachev because he was the boss? FURMAN: Yes. To the Orthodox he represented the Czar, and to the atheists he represented the General Secretary. But this atheistic part was diminishing very quicky. Two years before, they were 20 percent of the population. By 1990, they were only five percent. The young people who are educated had moved down here, into the New Age group. This is the zone of eclecticism, of entropy. I don’t understand why you use the word “entropy” about the New Age. FURMAN: Because it is not clear-cut convictions or coherent world views. A Russian man who is Zen Buddhist, for example, is just Zen Buddhist this month. Next month he will be Hassid, for example, or Hindu. The elements are labile, unstructured, and individual. It is like the Brownian motion of molecules, moving randomly. Entropy. This survey was conducted in 1990 and ’91 when Gorbachev was still in office. Is this true of the Russian population today? FURMAN: No, not anymore. The Orthodox and atheists were for strong power. Now that Yeltsin is the President, he is the strong power, not Gorbachev. They were for Great Russia. Now Yeltsin is the symbol of Great Russia. This three-part system doesn’t hold up anymore. I returned to Toronto thinking about Furman’s findings. He had portrayed the New Agers as in the middle zone of the line between Orthodoxy and atheism. Instead, I thought of them as equidistant from those two poles, but not on the same plane at all. I pictured his typology as an equilateral triangle, so that the New Agers were equidistant from the other two thought systems, yet quite different from both. The CPSU could hardly be called a revolutionary organization when Furman’s surveys were done in 1990 and ’91. The Party was reactionary and wanted to block change. So did the Orthodox Church, which long ago had come to terms with the Soviet Union. Instead, it was the New Age types who were un-Soviet. They wanted change — democracy, an end to authoritarianism. Even so, however, the model seemed incomplete. Dissidents didn’t fit into any of his three categories. Where did they belong? I finally figured that out. There are two ways of being un-Soviet. The New Agers are one way; the dissidents are the other. Both groups are profoundly un-Soviet, both want change, both reject authoritative doctrines — yet they differ markedly from each other. The New Age approach is what Furman called “fuzzy and incoherent.” The dissident approach is rigorously coherent and principled. So I added another triangle, showing dissidents opposite the New Agers, while also being equally remote from both of the authoritarian ideologies. This new model solved my puzzle! I had asked people why Sakharov, Grigoryants, and the other dissidents had hated Gorbachev, even after he had unlocked the prison door and let them out. Now it made sense. To them, he represented the Czar, or the General Secretary. He represented Stalin and Brezhnev and Lenin. He represented the dictator. The dissidents and the New Agers alike wanted a man who would stand up against the authority figure, as Yeltsin did by challenging Gorbachev and even destroying the Soviet Union in order to leave him with no country to preside over. Ironically, it was Gorbachev who was genuinely democratic.11 Soon it would be his successor’s turn to represent authority and thereby lose the support of those who desired change and opposed autocratic rule. And after assuming power, Yeltsin would practice authoritarianism in the old, militaristic style by shelling elected political opponents in parliament and waging war against the people of Chechnya. Dissidents were the most courageous, committed people living under totalitarianism. Almost no one expected a democratic revolution “from the top,” and therefore the dissidents took the only approach that seemed feasible to resist the oppression. They willingly accepted enormous personal sacrifices. Soviet prison camps in Siberia and Soviet psychiatric hospitals were terrible places where dissidents were known to perish. If there is any group of people who deserve monuments and peace prizes for their heroism, it is that small band of human rights activists who, in all the Eastern bloc countries, insisted on acting as if they were free. When they undertook an action, they were able to publicize it throughout the Soviet Union and around the world with the help of Radio Liberty or other foreign radio services. They encouraged each other and inspired others. Millions of Soviet citizens knew what they were doing. How much did they contribute in real, practical terms? If we look for proof, not much of it can be demonstrated. Still, though their number was small, officialdom knew that they had a stronger social base in the general population than could be measured by the number of signatures on their documents.12 In answer to a question in Toronto, Mikhail Gorbachev said, “The dissident movement, I think, reflected society’s protest against what was happening to it. So our entire society understood the need for radical reform.”13 The dissidents provided the evidence of the popular discontent — without which no revolution from the top would probably have occurred. It is one thing to know, but quite a different thing to do, when action required such sacrifice. Many Soviet citizens — even those who were unwilling to take overt political action — found other ways to opt out of the system psychologically. Some who agreed with the dissidents helped in quiet ways when they could, and others at least tried to live with dignity without betraying their own values. Communism and Orthodox Christianity, though opposed doctrinally, had much in common in 1990 and ’91 — a tendency to support the old system. Likewise, the “New Agers” and the dissident community, though differing doctrinally and in their style of political engagement, had much in common during that period — an openness to change and a readiness to question the old system. Yet their differences were more significant than their similarities. The dissidents were, by temperament, what Goldansky called “maximalists.” Regrettably, by pushing for the maximum change, even without the support of the majority of Soviet citizens, they were able to prompt the entire group of so-called “democrats” to abandon the reformer, leaving him to the mercy of his reactionary enemies. In this respect, Goldansky was correct and Sakharov was wrong. The best became the enemy of the good. 1 Interview with Andrei Orlov, Moscow 1992. 2 Gale Warner published a wonderful profile of Andrei Orlov in her book, The Invisible Threads (Washington: Seven Locks Press, 1991). 3 Sergei Kapitza, “Antiscience Trends in the USSR,” Scientific American, August, 1991, pp. 32-38. 4 Tarzie Vittachi, “OOOOOHHHHHHHHMMM.” Peace Magazine (June/July 1990), p. 28. 5 See David Remnick’s book, Lenin’s Tomb for an account of this healer. (New York: Random House, 1993) pp. 256-62. 7 Interview with Alexander Kalinin, Toronto, 1992. 8 See for example, the sad case of chemical engineer Vladimir Petrenko, as described a Canadian correspondent in Moscow, Olivia Ward, “In the Service of the States,” Toronto Star, Feb. 13, 1994, p. A11. 9 Murray Feshbach and Alfred Friendly, Jr. Ecocide in the USSR: Health and Nature Under Seige (New York: Basic Books, 1992). 10 There were certain exceptions to this pattern, as in the case of Peter the Great, who was not religious. 11 And ironically, Gorbachev was also especially congenial to the New Age culture. For example, he and his wife frequently meet and are on excellent terms with Sri Chinmoy, an unconventional Indian guru who maintains his headquarters at the United Nations. In her letters to him, Raisa, formerly a lifelong atheist, has repeatedly referred to God. Another person who reportedly has also shown a positive regard for Sri Chinmoy is Vladimir Petrovsky, whose contributions to peace will be described in later chapters. 12 Peter Reddaway, “The Role of Popular Discontent,” in The National Interest No. 31, Spring 1993, p. 59. Reddaway argues that this is the case and bases his conclusion on analyses of official documents recently extracted from Soviet archives. 13 Gorbachev was speaking at the University of Toronto, March 31, 1993.